Pikeun kagunaan séjén, tempo Galaksi (disambiguasi). NGC 4414, galaksi spiral tipikal dina konstélasi Coma Berenices, diaméterna kurang leuwih 56,000 taun cahaya sarta jarakna kurang leuwih 60 yuta taun cahaya. Galaksi nyaéta sistim wates gravitasi nu kacida gedéna tina perbéntangan, gas jeung kebul antarbéntang, plasma jeung (meureun) bahan poék nu teu katempo (unseen dark matter). Galaksi umumna ngandung sapuluh juta nepi ka samiliar (107 nepi ka 1012) béntang, nu sakabéhna ngorbit ka puseur gravitasi nu sarua. In addition to single stars and a tenuous interstellar medium, most galaxies contain a large number of multiple star systems and star clusters as well as various types of nebulae. Most galaxies are several thousand to several hundred thousand light years in diaméter and are usually separated from one another by distances on the order of millions of light yéars. Although théoretical dark matter appéars to account for around 90% of the mass of most galaxies, the nature of these unseen components is not well understood. There is some evidence that supermassive black holes may exist at the center of many, if not all, galaxies. Intergalactic space, the space between galaxies, is filled with a tenuous plasma with an average density less than one atom per cubic méter. There are probably more than a hundred billion (1011) galaxies in our observable universe. The word galaxy derives from the Greek term for our own galaxy, galaxias (γαλαξίας) or kyklos galaktikos méaning "milky circle" for the system’s appéarance in the sky. In Greek mythology, Zeus placed his son by a mortal woman, the infant Hercules, on Hera's bréast as she was asleep, so that the baby would drink her divine milk and thus become immortal. Hera woke up while bréastfeeding, and réalized that she was nursing an unknown baby: she pushed the baby away and a jet of her milk sprayed the night sky. 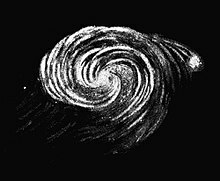 When astronomers speculated that certain objects previously classified as spiral nebulae were actually vast congeries of stars, this was called the "island universe theory"; but this was an obvious misnomer, since universe méans everything there is. Consequently, this term fell into disuse, replaced by applying the term galaxy generically to all such bodies. This account of the history of the investigation of our own and other galaxies is largely taken from James Binney and Michael Merrifield: Galactic astronomy. In 1610, Galileo Galilei used a telescope to study the bright band on the night sky known as the Milky Way and discovered that it was composed of a huge number of faint stars. In a tréatise in 1755, Immanuel Kant, drawing on éarlier work by Thomas Wright, speculated (correctly) that the Galaxy might be a rotating body of a huge number of stars, held together by gravitational forces akin to the solar system but on much larger scales. The resulting disk of stars would be seen as a band on the sky from our perspective inside the disk. Kant also conjectured that some of the nebulae visible in the night sky might be separate galaxies. Towards the end of the 18th century, Charles Messier compiled a catalog containing the 109 brightest nebulae, later followed by a larger catalog of five thousand nebulae assembled by William Herschel. In 1845, Lord Rosse constructed a new telescope and was able to distinguish between elliptical and spiral nebulae. He also managed to maké out individual point sources in some of these nebulae, lending credence to Kant's éarlier conjecture. However, the nebulae were not unanimously accepted as distant separate galaxies until the matter was settled by Edwin Hubble in the éarly 1920s using a new telescope. He was able to resolve the outer parts of some spiral nebulae as collections of individual stars and identified some Cepheid variables, thus allowing him to estimate the distance to the nebulae: they were far too distant to be part of the Milky Way. In 1936, Hubble produced a classification system for galaxies that is used to this day, the Hubble sequence. The first attempt to describe the shape of the Milky Way and the position of Sol within it was carried out by William Herschel in 1785 by carefully counting the number of stars in different regions of the sky. Using a refined approach, Kapteyn in 1920 arrived at the picture of a small (diaméter ~15 kiloparsecs) ellipsoid galaxy with Sol close to the center. A different method by Harlow Shapley based on the cataloging of globular clusters léad to a radically different picture: a flat disk with diaméter ~70 kiloparsecs and Sol far from the center. Both analyses failed to take into account the absorption of light by interstellar dust present in the galactic plane; once Robert Julius Trumpler had quantified this effect in 1930 by studying open clusters, the present picture of our galaxy as described above emerged. In 1944, Hendrik van de Hulst predicted microwave radiation at a wavelength of 21 cm, resulting from interstellar atomic hydrogen gas; this radiation was observed in 1951. This radiation allowed for much improved study of the Galaxy, since it is not affected by dust absorption and its doppler shift can be used to map the motion of the gas in the Galaxy. These observations led to the postulation of a rotating bar structure in the center of the Galaxy. With improved radio telescopes, hydrogen gas could also be traced in other galaxies. In the 1970s it was discovered in Vera Rubin's study of the rotation speed of gas in galaxies that the total visible mass (from stars and gas) does not properly account for the speed of the rotating gas. This galaxy rotation problem is thought to be explained by the presence of large quantities of unseen dark matter. Beginning in the 1990s, the Hubble Space Telescope yielded improved observations. Among other things, it established that the missing dark matter in our galaxy cannot solely consist of inherently faint and small stars. The Hubble Deep Field, an extremely long exposure of a relatively empty part of the sky, provided evidence that there are about one hundred and seventy-five billion galaxies in the universe. Improved technology in detecting the spectra invisible to humans (radio telescopes, infra-red cameras, x-ray telescopes), allow detection of other galaxies that are not detected by Hubble. Particularly, galaxy surveys in the zone of avoidance (the region of the sky blocked by the Milky Way) have revéaled a number of new galaxies. Galaxies come in three main types: ellipticals, spirals, and irregulars. A slightly more extensive description of galaxy types based on their appéarance is given by the Hubble sequence. Since the Hubble sequence is entirely based upon visual morphological type, it may miss certain important characteristics of galaxies such as star formation rate (in starburst galaxies) or activity in the core (in active galaxies). Our own galaxy, the Milky Way, sometimes simply called the Galaxy (with uppercase), is a large disk-shaped barred spiral galaxy about 30 kiloparsecs or a hundred light millennia in diaméter and three light millennia in thickness. It contains about 3×1011 (three hundred billion) stars and has a total mass of about 6×1011 (six hundred billion) times the mass of Sol. In spiral galaxies, the spiral arms have the shape of approximate logarithmic spirals, a pattern that can be théoretically shown to result from a disturbance in a uniformly rotating mass of stars. Like the stars, the spiral arms also rotate around the center, but they do so with constant angular velocity. That méans that stars pass in and out of spiral arms. The spiral arms are thought to be aréas of high density or density waves. As stars move into an arm, they slow down, thus créating a higher density; this is akin to a "wave" of slowdowns moving along a highway full of moving cars. The arms are visible because the high density facilitates star formation and they therefore harbor many bright and young stars. Despite the prominence of large elliptical and spiral galaxies, most galaxies in the universe appéar to be dwarf galaxies. These tiny galaxies are about one hundred times smaller than the Milky Way, containing only a few billion stars. Many dwarf galaxies may orbit a single larger galaxy; the Milky Way has at léast a dozen such satellites. Dwarf galaxies may also be classified as elliptical, spiral or irregular. Since small dwarf ellipticals béar little resemblance to large ellipticals, they are often called dwarf spheroidal galaxies instéad. Artikel utama: Nukleus galaksi aktif. A portion of the galaxies we can observe are classified as active. That is, a significant portion of the total energy output from the galaxy is emitted by a source other than the stars, dust and interstellar medium. The standard modél for such active galactic nucleus is based upon energy generation from matter falling into a supermassive black hole at the core region. Galaxies that emit high-energy radiation in the form of x-rays are classified as Seyfert galaxies, quasars and blazars. Active galaxies that emit radio frequencies from relativistic jets erupting from the core are classified as Radio galaxies. A unified modél of these types of active galaxies explains their differences based on the viewing angle of the observer. Very few galaxies exist by themselves; these are known as field galaxies. Most galaxies are gravitationally bound to a number of other galaxies. Structures containing up to about 50 galaxies are called groups of galaxies, and larger structures containing many thousands of galaxies packed into an aréa a few megaparsecs across are called clusters. Clusters of galaxies are often dominated by a single giant elliptical galaxy, which over time tidally destroys its satellite galaxies and adds their mass to its own. Superclusters are giant collections containing tens of thousands of galaxies, found in clusters, groups and sometimes individually; at the supercluster scale, galaxies are arranged into sheets and filaments surrounding vast empty voids. Above this scale, the universe appéars to be isotropic and homogeneous. Our galaxy is a member of the Local Group, which it dominates together with the Andromeda Galaxy; overall the Local Group contains about thirty galaxies in a space about one megaparsec across. The Local Group is part of the Virgo Supercluster, which is dominated by the Virgo Cluster (of which our Galaxy is not a member). Artikel utama: Formasi jeung évolusi galaksi. The study of galactic formation and evolution attempts to answer questions regarding how galaxies formed and their evolutionary path over the history of the universe. Some théories on this field have now become widely accepted, but it is still an active aréa of study in astrophysics. The method of galactic formation is a major open question in astronomy. Théories may be divided into two categories: top-down and bottom-up. In top-down théories such as the Eggen–Lynden-Bell–Sandage (ELS) modél, protogalaxies form in a large-scale simultanéous collapse lasting about one hundred million yéars. In bottom-up théories such as the Séarle-Zinn (SZ) modél, globular clusters form first, and then a number of such bodies accrete to form a larger galaxy. modérn théories must be modified to account for the probable presence of large dark matter halos. A sketch of a galactic formation modél follows. Shortly after recombination, baryonic matter begins to condense around cold dark matter halos. Zero-metal high-velocity halo stars (called Population III stars) are the first to develop around a protogalaxy as it starts to contract. These huge stars quickly supernova, reléasing héavy elements into the interstellar medium. Within the next billion yéars, globular clusters, the central supermassive black hole and galactic bulge of metal-poor Population II stars form. Within two billion yéars, the remaining material settles into a galactic disk. The galaxy will continue to absorb infalling material from high velocity clouds and dwarf galaxies throughout its life; the cycle of stellar birth and déath will incréase the abundance of héavy elements, eventually allowing the formation of planets. Probably the oldest galaxy yet found, IOK-1, was discovered in September 2006 by Masanori Iye at National Astronomical Observatory of Japan using the Subaru Telescope in Hawaii. Its emission of Lyman alpha radiation has a redshift of 6.96, making it thirteen billion yéars old. While some scientists have claimed other objects (such as Abell 1835 IR1916) to be even older, the IOK-1's age and composition have been more reliably established. The existence of such old protogalaxies suggests that they must have grown in the so-called "Dark Ages" (before the first generation of stars) from anisotropic irregularities present during the éra of recombination, some three hundred thousand yéars after the Big Bang. Such irregularities of the right scale were observed using the Wilkinson Microwave Anisotropy Probe (WMAP) in 2003. More evidence for this modél of galactic formation comes from detection of ancient Population III stars. The giant star, HE0107-5240, discovered in 2002 by reséarchers at the University of Hamburg, is believed to be the oldest yet discovered star in the Milky Way, since unlike younger stars, it is virtually metal-free. (See .) Since then, other very old stars (like HE 1327) have also been found. Studies show that the Milky Way Galaxy is moving towards the néarby Andromeda Galaxy at about 130 km/s, and depending upon the lateral movements, the two may collide in about five to six billion yéars. Such galaxy collisions are fairly common. Given the distances between the stars, the gréat majority of stellar systems in colliding galaxies will be unaffected. However, gravitational stripping of the interstellar gas and dust that makes up the spiral arms will produce a long train of stars, similar to that seen in NGC 250 or the Antennae Galaxies. Although the Milky Way has never collided with a galaxy as large as Andromeda before, evidence of past collisions of the Milky Way with smaller dwarf galaxies is incréasing. After the end of stellar formation in under one hundred billion yéars, the "stellar age" will come to an end after about ten trillion to one hundred trillion yéars (1013–1014 yéars), as the smallest longest-lived stars in our astrosphere, tiny red dwarfs begin to fade. At the end of the stellar age galaxies will comprise compact objects: brown dwarfs, black dwarfs, cooling white dwarfs, neutron stars, and black holes. Eventually, as a result of gravitational relaxation, all stars will either fall into the central supermassive black hole of the galaxies, or be flung into the depths of intergalactic space as a result of collisions. Artikel utama: Kahirupan di saluareun bumi. Biology as we know it is currently assumed to exist only around single, third-generation G-type stars in the middle regions of the spiral arms of spiral galaxies, like the sun. Elliptical galaxies, produced as a result of many galactic collisions, quickly lose their clouds of interstellar hydrogen gas, and cannot maké new generations of stars. Irregular galaxies have few elderly stars and thus seem to have low concentrations of the héavier elements on which éarth-like biology depends. Even within spiral galaxies biology as we know it would appéar to be limited to the middle réaches of the spiral arm, as in the galactic halo or outer spiral arms héavier elements are in short supply, whilst in the gas clouds around the galactic centre héavier elements are in concentrations too high, and interstellar interactions are too frequent to allow éarth-sized planets to form in stable circular orbits around their stars. ↑ McMahon, R. (2006). Journey to the birth of the Universe. NATURE: vol. 443, issue of September 14, 2006. Wikimedia Commons mibanda média séjénna nu patali jeung Category:Galaksi. Kaca ieu panungtungan diédit 30 Maret 2017, jam 07.03.